Low-key, effective storytelling and a hyperfocus on puzzles. The Swapper exemplifies the adage that less is more. 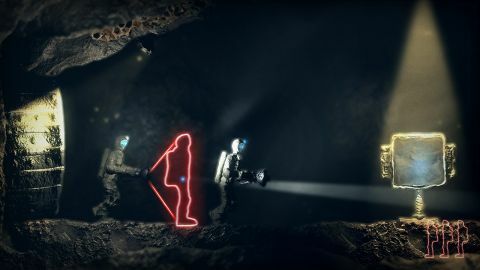 Built of clay and the echoes of Stanley Kubrick's creative ghost, sidescrolling puzzler The Swapper is superb. It's clever, moody and forward-thinking in its disdain for conventional, permaroided protagonists, but also irrepressibly frustrating. Like the charming rapscallion you can't help but like, The Swapper will drive you up the wall and have you coming back for more. Disquieting in the way that only abandoned spacecraft can be, the game hinges on a single conceit: you can make clones. Lots and lots of clones. With the help of the titular device, you can generate a replica of yourself with a click of the rightmouse button, then propel your consciousness into that new body with a tap of the left. It's that simple. And that gruesome. The clones, of which you can have up to four, will blindly mimic your every movement. They're the mainstay of your interactions with the game: you'll use them to push blocks, stand on buttons and do whatever is necessary to unearth the mystery of your surroundings. In the process, however, you're going to kill them repeatedly. At times, it'll be accidental. At times, you'll fling them knowingly off a ledge to get what you want. Crunch. Thud. Crack. But there's nothing wrong with that, right? After all, they're just empty vessels, containers your mind has oh-so-recently vacated – wait. What is life? If a rock, one completely devoid of any biological function, is capable of sentient thought, does it put it on the same level as a human being? These are some of the many questions that The Swapper insinuates. Delivered through the many terminals littering the space station Thebeus and the odd cutscene, the story will have you ruminating on the nature of your existence even as you unravel what has happened here. When not otherwise asking you to evaluate the measure of a soul, The Swapper will have you manoeuvring through Thebeus's labyrinthine depths in an attempt to gather a congregation of orbs. To do so, you're going to have to figure out how to circumnavigate levers, obstacles and coloured lights (depending on their hue, these sources of illuminations can cancel your ability to produce clones, to swap to them, or both). It's a routine concept but one implemented with a delicious amount of competence. The puzzles, which start easily enough, ramp up speedily in terms of difficulty. Though they progress at an expected incline, they can still be absolutely rage-inducing, as there is no way you can get around solving any of these buggers. The Swapper is one of those games that will stick in your mind. Years down the road, when you have grandkids demanding tales of retrotastic delights, The Swapper will be among those you reminisce about when you're telling them of nonviolence done right.